Evaluation Officer, Case Registry Assistant vacancies under National Mental Health Program. Total available vacancies in DHS, Naharlagun Recruitment are 26 posts. Candidates with eligible criteria may download the application form from NRHM Arunachal Pradesh official website www.nrhmarunachal.gov.in. Last date for submission of filled application with attendance sheet and attested documents is 30th October-2017. Applicants will be recruited for selected post is based on written test and followed by viva voce/ Interview held by the Directorate of DHS. Date and venue of written exam and Viva Voce test will be displayed on the notice board of DHS, Naharlagun. After selection candidates will be paid for each post as per DHS Govt rules. For more information of application procedure, selection method, age details, pay scale, educational qualifications of Directorate of Health Services DHS, Naharlagun Recruitment Psychiatrist, Psychiatric Nurse, Community Nurse Jobs recruitment are mentioned below. 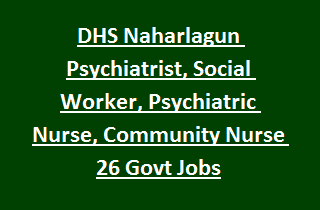 Total available vacancies in DHS, Naharlagun Recruitment are 26 posts. 2. Clinical Psychologist: 04 posts. 3. Psychiatric Social Worker: 03 posts. 4. Psychiatric Nurse: 05 posts. 5. Community Nurse: 04 posts. 6. Monitoring & Evaluation Officer: 01 post. 7. Case Registry Assistant: 04 posts. Psychiatrist: MD in Psychiatry from recognized Institution or equivalent degree. 2 years of work experience as a specialist in Hospital. Psychiatric Nurse: BSc Nursing from recognized Institution by Nursing Council of India. Must have 2 years of experience in Psychiatry/ Mental Health Institution or Hospital. Clinical Psychologist: PG Degree in Psychology/ Applied Psychology/ Masters in Philosophy in Mental Health & Social Psychology. Mode of selection for NRHM vacancies is based on written test and followed by viva voce/ Interview. For each post there will be one question paper conducted for 100 marks. Total no of questions are 50. Each question carries 2 marks. The topics to be covered are General English, Current Affairs. As per the merit in written test candidates will be called for Viva voce test in the ratio of 1:3. Date and venue of written test will be displayed in the Directorate of Health Services, Naharlagun notice board. Interested candidates may download the application form from NRHM Arunachal Pradesh official web link www.nrhmarunachal.gov.in. Fill the application and submit with attendance sheet and attested documents before 30th October-2017.